This low sugar Blackberry Jam Recipe is far superior to anything you can buy at the store! This Blackberry Jam Recipe is tart, yet sweet, and just tastes like a summer day! Blackberries are the only fruit that I prefer to deseed. The seeds are so large in blackberries, in comparison to raspberries! I freeze the juice until the weather cools down because it is so hot when we pick them, I can’t bare to turn on the canning pot to fight with air conditioner! It seems like a waste of energy. We have about 2 acres on our property that has wild blackberries growing on them. We rather nurture them a bit, because we so love the fruits of our labor. Eric and I have been picking them for years, so we are pretty careful picking them. The issue is not putting your hand in to reach a huge, plump blackberry, the danger is in pulling your hand back out! The thorns are angled so that the extraction is the dangerous part. A few years ago, when my in-laws started staying with us for the summer, in their motor home. My Father-in-law and our neighbor across the street had this competition going, I swear, like, who could get the biggest berry. The biggest berry is inevitably in the middle of the patch! The competition ended up being, who could get their arms and legs more scratched up by blackberries! They both looked like they had been through a war!  Deep, painful gashes for weeks! Heros I tell ya, all for the elusive biggest berry! Use Kitchenaid Juicer attachment to deseed blackberries, if desired. Alternately, the juice can be squeezed through cheesecloth or a strainer but it is no fun. I did it for years, even though I had a Kitchenaid Juicer in the closet. “Why?” you ask. Because, dear reader, until my friend Laura, with her “Canning tomato sauce in my Kitchen” post reminded that I had one, I did not think about that! Um, what? This bowl contains the seeds and bigger chunk of pulp. Add the juice with water to a large pot. Mix the pectin with 1/4 c. sugar, to help the pectin mot to clump. Add to the pot with the juice. When it comes to a full rolling boil (one that can’t be stirred down), add the rest of the sugar all at once. Again, bring the mixture to a full rolling boil and continue to boil hard for at least 1 full minute. Immediately ladle into hot sterilized jars. Put on lids and hand tighten rings. (Not too tight!) Place jars in a water bath canning pot and process for 10 minutes. Adjust for altitude, here is a great graph! Let jars rest in canning pot an additional 5 minutes. After the rest remove the jars from the canning pot and let cool on the counter for 24 hours. After a short amount of time you will here the lids “pop” that is always a good thing because that means that they have sealed. Check the lids after the 24 hours. Any lids that snap in the middle have not sealed properly and should be refrigerated. The sealed jars are best stored in a cool, dark place, like a basement. Biting into this Low Sugar Blackberry Jam in the midle of February cheers me up and makes me think that indeed, one day soon, I will be picking more blackberries! I hope you enjoyed the post today for this Low Sugar Blackberry Jam Recipe! Thanks for stopping by! Don’t forget to sign up for my mailing list so that you don’t miss any new recipes! Juice blackberries, either with this attachment for your kitchen aid, using a food mill or other juicer, or by hand. The easiest way to juice them by hand is to let them cook down for about 15 minutes in a a bit of water. Then run the juice through a sieve lined with cheesecloth. Juice can be frozen for later use. Prepare jars. Wash in hot soapy water and rinse thoroughly. Place directly in water bath canning pot. Cover clean jars with water about 2 inches above jars. Boil jars for 10 – 15 minutes to sterilize. Let jars sit in hot water until ready to fill. Place washed lids in a small saucepan and cover with boiling water. Let sit until ready to use. I also add my ladle and funnel to this pot to sterilize them. Add juice and water to a large, heavy bottom pot. Heat over high heat. Meanwhile, mix pectin with 1/4 cup of sugar to keep the pectin from clumping, Add the mixture to the pot. Stir constantly, after pectin is added. Bring plums to a boil and add pectin/ sugar mixture. Bring to a full boil (one that can’t be stirred down). Fill jars, leaving 1/2" headspace. Wipe rim of jars with clean paper towel and place lid on. Add band and tighten to fingertip tight. Place filled jars into canning pot and bring to boil. Low boil for 10 minutes. Turn off heat and allow to sit in water for 5 minutes. Remove them to counter and let them cool. After 24 hours, check lids by pushing down in center. If lids flex up and down, the jar is not sealed and should be refrigerated. This recipe makes 2 half pint jars jam. Sign up for BCC Mailing List~ Never miss a Recipe! And... Get my ebook, Mexican Made Easy! This post may contain affiliate links, which means I get a small commission if you click the link and purchase something, at no additional cost to you. See FTC Disclosure, here. Wow! My kids are going to flip! And I get to make it low sugar. Double bonus! I know. That is certainly an added bonus! Thank you Jennifer! This low-sugar blackberry jam sounds perfect for pancakes too! Yes, sure, it would be good on pancakes, but I do make a blackberry syrup too! Check that out! This jam looks amazing! Perfect for toast or biscuits! Thanks Jessica! Yes, it is one of my favorites! Low sugar! That’s right up my alley! 🙂 I have to admit, I’ve never tried blackberry jam before. It sounds and looks delicious! I can’t believe you have never tried blackberry jam! That is amazing! It is the best!! Thanks for the comment, Sherri! I love blackberry jam – such a good way to use up all the blackberries we have round at the moment. Sadly mine are all gone now! I have lots of juice in the freezer though! Thanks Danielle! It really is a dangerous business!  I hope the post helped you make your own! Thanks Anna! 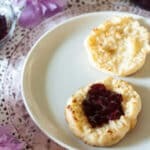 I have never tried blackberry jam before but this recipe looks delicious. Reminds me of being in my grandmas kitchen when she would give me a tea biscuit with her homemade raspberry jam and some tea. Funny how certain foods bring up memories. Thanks for sharing. That’s one of the most fun things about food, in my opinion! Thanks so much, Alisa! I love how you did this with less sugar! Such a great way to use the last of the summer fruit. I bet it tastes amazing. The low sugar version really does tastes more like fresh fruit! Thanks for your comment, Julie! Incredible! How do you manage those 2 acres of wild blackberries?! I do make a mistake of getting my hand out quickly (I have a few bushes of wild berries that have thorns). But that is only because I am anxious to use them in another recipe! Great jam! My husband and Father-in-law mow large strips to walk, so that you don’t have wade through the middle of them. Then every 4 or 5 years we you a brush hog to mow them and all of the small tree saplings down so that the area doesn’t turn into forest. Thank you Jacqui! Oh, I 100% agree with you! It is so much better with less sugar! Thank you Ramona! This looks fabulous! I have to get me one of those juicer things for my KitchenAid! I love all jams but blackberry is among my favorites! It is super handy! Thank you Elaine! You will love it! Blackberry jam is the best, isn’t it? Thanks for the tip about using the kitchen aid juicer. The blackberries had just been sitting in the freezer because it was such a pain pushing them through the sieve. It was so funny! I used to do the same thing and it was such a pain! Then it dawned me that I had had the juicer in my cupboard for 30 years, lol! I’m glad it helped you Beth!